It is that time of the week again and fantasy lineups are needing to be set. It is deep enough into the season that the waiver wire is in full swing and some people are already looking for major trades. I am not one to freak out about my team this early in the season but my 1-2 start does make me question why I am the one writing any sort of fantasy football article. Yet they keep bringing me back and haven’t asked anybody else to fill in for me. Last week, I mentioned losing because Ryan Fitzpatrick outscored Andrew Luck in the Monday Night Football game. I didn’t think it could get worse than that but I was quite wrong. A Chiefs wide receiver finally had himself a day as Jeremy Maclin put up 20 fantasy points against me last week, sending me toward an 8-point loss. It was the first touchdown by a Kansas City wideout since 2013. To make matters worse, in the league we have among some Touchdown Alabama writers, I am 0-2-1 despite being the league’s second highest scoring team. This year just wasn’t meant for me to hoist any sort of trophy. Once again, I digress from why you are here. For many of you that have former Tide stars on your team, this past week was a big success for you. Julio Jones continued his stretch of ridiculousness after a huge performance against the Cowboys. Mark Ingram and the Saints put together a pleasantly surprising performance together against a strong Carolina defense. Jalston Fowler even got on the board with his first career NFL touchdown. Let’s take a quick look at each player’s week three performance while giving a preview of what is in store for them this week. 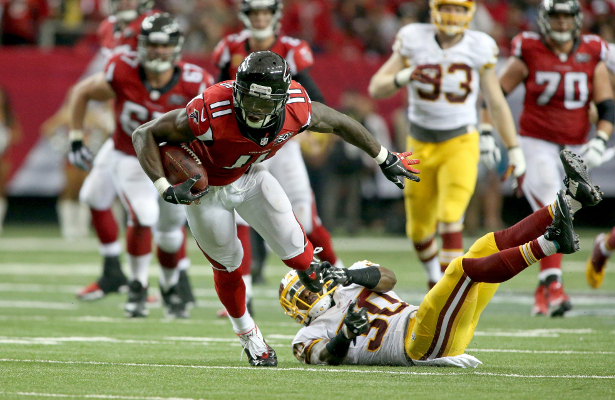 Julio Jones saw an amazing 20 targets from Matt Ryan on Sunday afternoon against Dallas. He reeled in 12 of them for 164 yards and two touchdowns for 28 total fantasy points. It was his second 20+ point performance this season and third straight double digit day. People are already saying Jones could be on his way to the best fantasy football season by a wide receiver ever. He is once again listed as questionable heading into the week but that hasn’t stopped him yet this season. The Texans secondary is strong, led by former Crimson Tide cornerback Kareem Jackson, but they haven’t seen a receiver like Julio Jones so far this season. Houston allowed two touchdowns on just nine catches by wide receivers in week two and Jones could take advantage of the safeties on deep throws. ESPN and Yahoo both have Jones projected for 13 points this week but I am going a little higher. I believe he gets 16 more targets and comes away with nine catches for 95 yards and a touchdown, finishing with 15 fantasy points. The second-biggest performance of the week for the Crimson Tide was Heisman winner Mark Ingram. His 15-point fantasy performance came as a surprise (at least to me) along with how well the Saints played against the Panthers. Ingram got 19 touches for 99 total yards and got in the endzone for the second consecutive game. This week, Ingram faces an inconsistent Cowboy defense that has given up 54 points to running backs in their two home games but only allowed seven points to Philadelphia’s running backs in week two. Which defense shows up on Sunday night will be a huge factor to Ingram’s fantasy production. Ingram has exceeded my expectations more of the season and although he has three straight double digit games, I believe the Cowboys have a strong defensive showing and limit Ingram to less than 100 total yards and no touchdown. ESPN and Yahoo agree on Ingram this week, setting him at 11 points but I have him back down in single digits, finishing the night with just eight fantasy points. Amari Cooper had another big week and could have had more but he lost a fumble, losing him two fantasy points in most leagues. Cooper caught 8 of his 11 targets against the Browns for 134 yards but didn’t score in the Raider win. He was the most targeted receiver for Oakland and has already become Derek Carr’s go-to receiver through the first three weeks of Cooper’s career. This weekend, the Raiders play against a Chicago team that has given up big games to Green Bay and Arizona receivers. Cooper doesn’t have Aaron Rodgers or Carson Palmer throwing him the ball but can still be set up for big fantasy numbers on Sunday. Expect Cooper to see around 11 targets again, I have him finishing with nine receptions for 112 yards and a touchdown. I have Cooper being this week’s leading scorer at 17 points, which is 10 more than what ESPN and Yahoo have him projected at. Eddie Lacy shocked many people and played through his ankle injury on Monday night against Kansas City. He still saw less touches than backup James Starks but Lacy had a couple of big plays that helped set up two Packer touchdowns. Lacy finished the night with eight fantasy points – 46 rushing yards and 41 receiving yards – which was still a step up from the week before when he got injured against Seattle. He should be back in full health this week against a bad San Francisco defense. The 49ers have allowed 57 points to running backs the last two weeks, including a huge week by Chris Johnson of the Cardinals last Sunday. However, Lacy will have to travel to the west coast for the game, where the 49ers held Adrian Peterson to just 31 rushing yards in the season opener. Lacy is projected for 13 points by ESPN but I have him going for 100 total yards of offense and a touchdown for 16 total fantasy points in week four. Jalston Fowler is once again not at the bottom of the list after his first NFL touchdown on a 1-yard plunge to bring the Titans within two points of the Colts with under a minute to go. Unfortunately, he may have suffered an injury on a failed two-point conversion attempt on the following play. I’m not ready to say he is worth a roster spot on anyone’s fantasy team, especially with the injury, but he may be worth keeping on your watchlist after seeing five short yardage carries in week three. The Titans are on a bye week this week but will be back against a strong Buffalo defense in week five. T.J. Yeldon lost the battle of getting into the endzone and had a disappointing performance in a blowout loss to New England. I was right about the Jaguars needing to go to their passing game early on but Yeldon only saw three targets and couldn’t get anything going on the ground. He finished with just three points and will now go to Indianapolis where the team may have to be throwing the ball a lot again. Yeldon may be able to find some running room early on against a defense that has struggled against bigger backs so far this season. ESPN has Yeldon at 10 fantasy points but I will have to side with Yahoo, which has him at 11 total points this week. I think he finishes the game with only 55 total yards offense but a touchdown on one the game’s early drives before the Jaguars turn to the passing game.